I have a list of emails, and I want to change the two letters before "@" and the first letter after "@" using Notepad++. I want to change the two letters before "@" and the first letter after "@"
Set "Find what" to ..@. 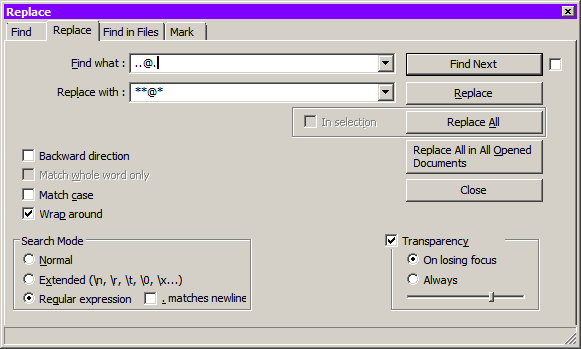 You can do this by using a regex search/replace. At the bottom, select Regular Expression. @ has no special meaning in regex so it means a literal @.
. means any character, exactly once. By writing .. it means 2 characters of any kind, as long as there are 2 characters.